Sometimes the best blogs are the ones I don’t post – at least not immediately. I wrote the below blog (the indented paragraphs) seven days ago, aside from a bit of tidying up today. I wasn’t going to post it at all but having re-read it, I think it’s worth publishing as it reminds me how much can change in a week. There’s this other me. She looks like me, although perhaps she’s a bit longer and leaner. She sounds like me, although maybe she speaks a little softer (my friends are often politely asking me to pipe down in restaurants). But she thinks and acts differently. Her life flows, she makes decisions with ease and without stress and follows through on them. She honours her hopes and dreams and behaves consistently towards herself and others. She squeezes joy out of every day. She doesn’t exhaust herself with endless rumination. Right now, I’d love to be that other me. Because despite everything I’ve learned and written about self-acceptance, I’m not getting on too well with the real me. I’m frustrated with her, tired of her, angry with her. I’ve had it with her. I want to keep the bits of her that dream – that ambitious side of her that wants a bigger life, that wants to put her gifts to use in a way that brings her joy and is of benefit to others, that imagines a life filled with love, peace and creativity. But I want to lose the other side – the stress, the worry, the indecision, the rumination, the low self-esteem, the insecurity and the fear. The fear of living, of choosing, of risking; the fear of people, of death, of life; the fear of saying no to others, of saying yes to myself; the fear of hurting and being hurt; the fear of poverty and homelessness (yes, despite my relative wealth – I’m a home owner in London – that’s a deep-rooted one); the fear of failure but, more importantly, the fear of success. I want to lose that side of me – all of it. If I had a cleaver, I’d cut it off, chop it into tiny pieces and discard it, or burn it and sprinkle the ash in the Thames. Extreme? Yes, but that’s how I’m feeling right now. Sometimes I think I used to be this other me and that I’ve lost her, but maybe I’ve always been like this – I just had some pretty efficient, albeit self-harming, mechanisms to turn me into someone else in the past. But they stopped working or I chose to give them up. And as much as I love and cherish much of what I’ve uncovered since, right now I despise the other part. I’m so bored of it – the way it drags me down, exhausts me, robs me of hours of my day or nights of sleep, leaves grey circles under my eyes or furrows on my brow. That’s as far as I got a week ago and although it might sound self-punishing, self-critical and self-harming in parts, not very self-accepting, I can tell you it was cathartic to write at the time. It brought my anger and frustration right to the surface and triggered some healing tears. It showed me the real power of words – at least for me. And seven days later, as I sit here feeling much calmer, more self-accepting and quite loving towards the me I wanted to chop into pieces a week ago, it’s really good to read. So what’s changed? Well, I’ve made a lot of the decisions I was grappling with and I’ve discovered some really useful tools to help me make those decisions – most importantly, other people. I’ve shared my concerns, my worries and my constant to-ing and fro-ing with friends and then I’ve given myself some time to reflect. But even more importantly, I’ve come to a better understanding of myself and how I function. I used to like to be in perpetual motion, to make decisions quickly, get things sorted, done and dusted, out of the way. But it’s becoming apparent that I need a good amount of time to process feelings and information. I am capable of making good choices for myself – yes, I am – but not immediately and not under pressure, from myself or others. The other interesting discovery is that these deadlines I so often give myself when it comes to choices generally do not need to be respected. Yes, there are practicalities that need to be considered when it comes to certain choices but I don’t have to hurry everything. I can take time to reflect. And while consideration of others is important, I’ve learned it’s vital to ask myself what is right for me and use that as my starting point. It’s when I throw everyone else’s potential feelings and opinions into the mix that I get muddled. And that muddle, after a while, turns to paralysis. All this is really useful information for myself for the future and I hope I can take it into account. And as I’m sitting here, a number of choices under my belt, I do wonder what all the fuss was about. Because I’ve also discovered I’m not the only one who struggles with this stuff. And if you don’t, you’ll likely struggle with other stuff that I might find a breeze. Strengths and weaknesses. That’s why we need each other. So I can temper that side of me that stresses and worries by understanding the core issues at the root of my rumination and indecision, but I can also accept it, try to understand it, find tools to make it easier to deal with and, ultimately, embrace it. With a big, warm-hearted hug. Because it’s part of me. It’s as much a part of me as the part that propelled me this lunchtime – yes, November 4th – into the sea off the coast of Dorset (without a wetsuit) for an icy cold but glorious swim as the sun shone. From the sand, the water looked amazing and enticing and I knew I’d enjoy a dip but initially I was put off by the walkers, all wrapped up in coats and scarves. What would they think? They’d point and say I was crazy? I was more deterred by other people’s opinions than the prospect of blue toes. And then a jogger arrived, stripped down to his shorts and walked in as though it was the Mediterranean in August. I thank that man. Yes, people pointed and I’m sure the word ‘crazy’ was uttered a few times. But I didn’t see a crazy man – I saw the most sane person on the beach! So in I went. And as I put my head under and did a few strokes, my whole body came alive, my heart filled with joy and I felt like a child again. All the worries – all the shoulds and musts – dissolved as I swam on my back looking up at the sun. And I’m still feeling the benefits seven hours later. In that moment, the decision I made to move out of my flat for a month to explore living at the beach and to go on holiday – which seemed completely insane as I frantically packed up my flat on Saturday and got on a late night bus and train – felt like the best choice I’d made all year. And that cold dip also confirmed what I already knew – that I really am moving to the sea. 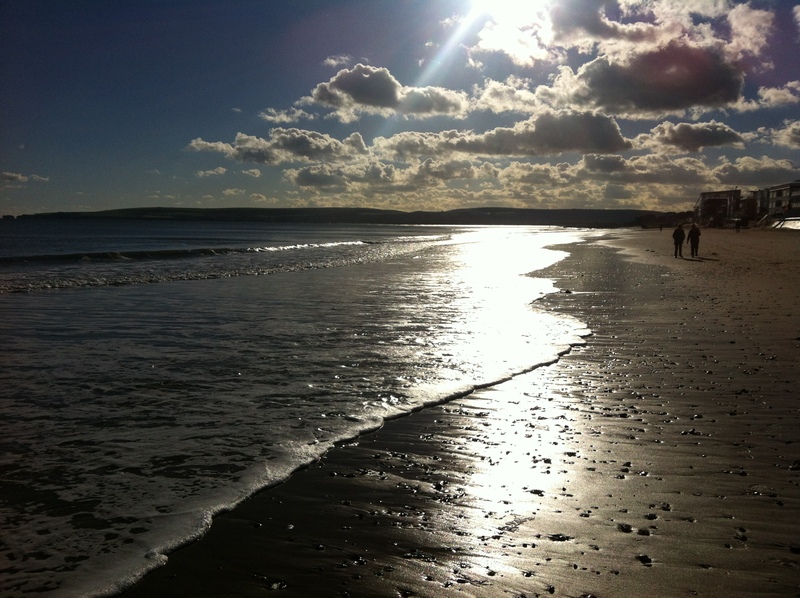 This entry was posted in Leisure, Recovery, Self-Acceptance, Women and tagged beach, decision-making, decisions, Dorset, indecision, open water swimming, sea swimming. Bookmark the permalink. Hi Katherine, the idea of a “chemically enhanced version” of the self is really interesting and one I never considered before. When I was taking medication (after weeks of agonising if it was the right thing, too soon, a cop out etc.) I felt exactly like the old me, but just not falling apart at the slightest hiccup in the road. What came to be true for me is the belief that I have, in my unique body chemistry, less happy hormones to start with than some other people. In the difficult times that we all have, my already low levels really start to deplete but in a slow almost imperceptible way until I am so deficient even tiny challenges (like whether to ask a chum round for coffee) become insurmountable. By correcting the hormonal deficit, life carried on exactly as before, but I was simply able to view things more objectively and dispassionately and as a consequence my path was less of a struggle. Not chemically enhanced for me, but chemically restored. Thanks for writing. I’ve just noticed your comment so sorry for the delay. It makes a lot of sense what you say about feeling chemically restored and I’ve heard similar things before, which is why I always keep medication as an option. I can relate to feeling unable to cope with small hiccups in the road – I’ve had plenty of periods like that and it’s amazing how they come and then they go. Right now, they’ve gone and I am feeling chemically restored, thanks to 12 days in Dorset by the sea (including a swim in freezing cold water!) and a day in the sunshine in Dubai (visiting my brother). I’ve gone eight more days here so I’m hoping I’ll feel very much restored by the end of it. But I struggle/suffer with anxiety and know it will always be a battle. I can dip down quite quickly. And then when I’m back up, I wonder what I was worried about! Hope you find the support you need where you are. It’d be lovely to catch up soon properly. I know what it’s like to struggle with those parts of yourself that sometimes you want to get rid of. As I practice self-acceptance, I try to be nicer to those parts–ask them what’s going on, if they can give me some respite from the chatter. And when they can’t, I try to accept that this will just be a day with a lot of obsessing. I try to think of them as family members who drive you crazy but you can’t get rid of. You just have to figure out a way to get along. Thanks so much for reading and writing. I like what you say about speaking to those parts of us that drive us crazy and asking for respite. It sounds like you’ve reached a great level of self-acceptance, which gives me hope! What a lovely post! Thank you for sharing your heart! I found you via. Gateway Women. I’m excited to follow you on your journey. Hugs!